I don't know if it's the 13 years of schooling that can't stop teaching us how America is the hero of the world or the fact that we grew up with grandparents who actually lived through the war, but Americans have a soft spot for all things WWII. This is certainly true in the movies, where it's hard to pick out more than a dozen popular war movies that aren't about WWII. Despite our country being in a fair number of "conflicts" since then (I mean, really Congress? ), we really don't think back to Korea, Vietnam, or Iraq/Afghanistan (not to mention our hand in all the wars in Central America) with any kind of fondness. 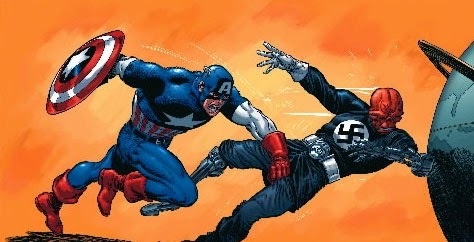 We think of WWII as "the good war," which makes Captain America an iconic "good guy" superhero. I think it would feel unpatriotic to dislike him, even though his first movie was dull and uninspired. 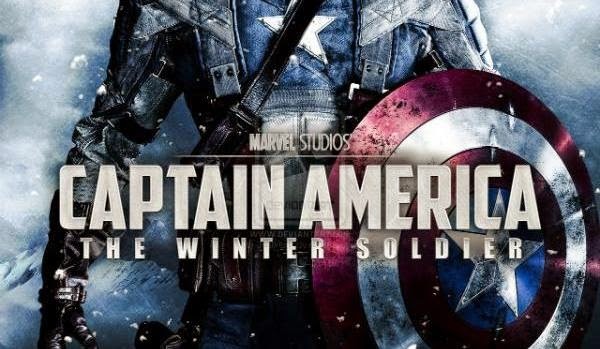 But, since everything gets a sequel these days, and I can't seem to escape watching them, Captain America was given a shot at redemption and I was there to watch it. He brought all of the idealism and wholesomeness we associate with the 40's and managed to make it not seem out of place in the cynical present. There was also a fair bit of hand to hand combat, which sets it apart from the usual explosion-filled, gun-firing action movie. (Though there were plenty of explosions as well.) Even Samuel L. Jackson managed to get a few lines out that were under 150 decibels. There were, however, still some negatives to contend with. For one, Marvel decided yet again to do the whole "rebel rides a motorcycle in a white t-shirt and jeans" thing (did they confuse him with Wolverine? ), which you'd think they understand to be sort of played out by now. And Scarlett Johansson still doesn't use a Russian accent which still bothers me. Then they work in some emotional chit chat for her, which seems out of sync with the character they've crafted for her thus far and frankly, are some of the worst parts of the movie. I'm no comic book nerd, but it seems like Marvel is squandering the opportunity to make Black Widow a totally badass character with her own spin off with her weak portrayals in these Captain America movies. And all the tight leather outfits in the world can't make up for the fact that Scarlett Johansson just shouldn't be a redhead. Overall, despite the pain in watching Robert Redford well past his glory days and a couple of plot twists that aren't even mildly unpredictable, it was still way better than expected. Maybe because it has a stupid title. Final word: Between this and Guardians of the Galaxy, I almost forgive Marvel for making so many Spiderman movies.